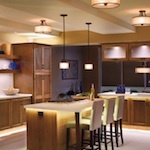 Homeowners who renovate their kitchens often don’t consider one of the most important concerns: the kitchen lighting. It’s a common oversight because many homeowners mistakenly believe that they have to leave out sufficient kitchen lighting in order to use this room in a modern way. With good design, common sense, and some of the latest lighting technology, your kitchen can remain the center of life in your house while providing plenty of light for your work. There are many new products and ideas that can help you bring out the character of your kitchen; lighting might seem like a “no brainer” but it can be trickier than you think. The problem is that even well-informed homeowners might not know about all their options. In most cases, getting a little help from a professional will give you a far better idea not only of what’s available, but of how newer products (and older products, as well) are likely to perform and hold up.